A group of mysterious woman have lived high up in the White Carpathian Mountains. They are far away from everything, which is why it is said that certain women among them have succeeded in preserving knowledge and intuition the rest of us have lost. They have passed this knowledge down from generation to generation for centuries. They are known as goddesses, because they are able to connect with God and ask for His help. And His interventions do help a little … It is said of the goddesses that they see the future. So why haven’t they saved their own? 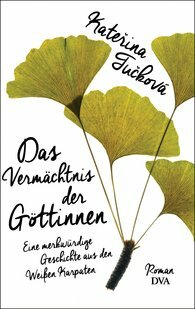 The original Czech edition won the 2013 Readers Award of the Czech Book, 2012 Josef Škvorecký Award and the 2013 Magnesia Litera – Readers’ award.